A well-deserved evening of laughter, drinking, music, games, prizes (wine!) and parental commiseration comes to OC with the three years running, The Pump and Dump: A Parentally Incorrect Comedy Show and Night Out For Once. 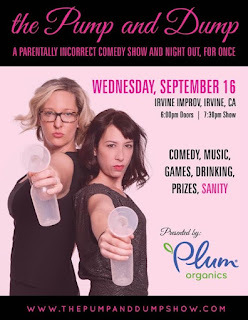 With a home base in Denver, Colorado the two mom show has been to San Francisco, Boston, NYC, Tempe, LA, Kansas City, Cleveland and next month will be in Orange County for one night only - September 16 - at the Irvine Improv (www.irvine.improv.com).